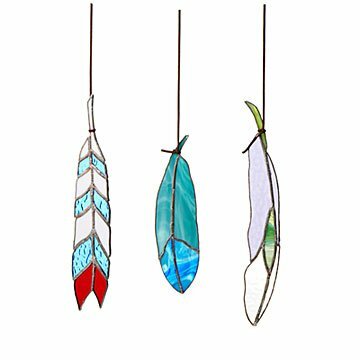 Hang one of these handcrafted, stained glass feathers in a window to catch the light. These stained glass feathers from artist Colin Adrian transform sunlight into joyous flights of color. Adrian was an internationally-trained painter before finding his wings in the medium of stained glass. Here, he captures the complex nature of a feather―the simple geometries of its outlines and the infinite variety of its coloring and detail. Hang one in any sunny window where they can catch your eye, or cluster all the varieties together for an extra lift in your day. Handmade in Brooklyn, New York. Colin Adrian is an American artist born in Southern California in 1976. In 1999 he moved to Brooklyn, New York where he resides today. Throughout his life he has been interested in many facets of art, primarily oil painting. He received his BFA in fine arts and animation from the University of Oregon as well as having spent a year abroad in Florence Italy, where he studied figurative painting at the Lorenzo di Medici Art Institute. He discovered his love for stained glass while visiting the Marc Chagall windows in Nice, France. His stained glass pieces are typically bright and alive with color that will pleasantly illuminate any room or environment in which they are placed. He is an avid traveler, constantly observing and inspired by cultures other than his own which influence his artistic choices. "There's something so final about glass as opposed to oil. I can confidently walk away from a piece knowing it's finished." Fragile; wipe clean with a damp cloth or window cleaner. Every feather is a handmade and one of a kind, some variance is to be expected. I enjoy it daily and I know my son and hiswife will love as their anniversary git 9/11. Beautiful vibrant colors, buying one again in February. Lovely products, I will be purchasing other items soon. I bought this as a gift for a friend, who is an artist, her initial reaction was 'wow' followed by " I love it". It is beautiful and good value for the money. I am very pleased with my stained glass feather. This was a beautiful and unique gift for my 13 year old granddaughter who is an artist and a lover of birds! This beautiful hand crafted feather is the perfect gift for my sister. How do I know? Because I covet it !! I opened the package to have a look,and it is just as beautiful as I imagined it to be. My advice.... Pick up one for yourself and one for a gift. Truly gorgeous in a window! It was bigger than I thought it would be and the design was exactly as represented on the website. All of the colors become incredibly illuminated when hung in the window; it is a reminder to my mom that the birds are returning soon and the vibrant colors of spring will replace the grays of March. Lovely, for year round enjoyment. She collects feathers and it was a great addition to her collection. Plan on buying more in the future !!! I hung this in my window and love the way the sun catches & shines through it. It has such beautiful vivid colors. very nice stain glass feathers.